As Ryan Nugent perfects the arrangement of his products, he strategically places some of his favourites towards the front of the display in his office. The logo that Nugent takes such pride in is eye-catching. It reads: Concrete Collective. “It’s all about product placement,” he says with a laugh. 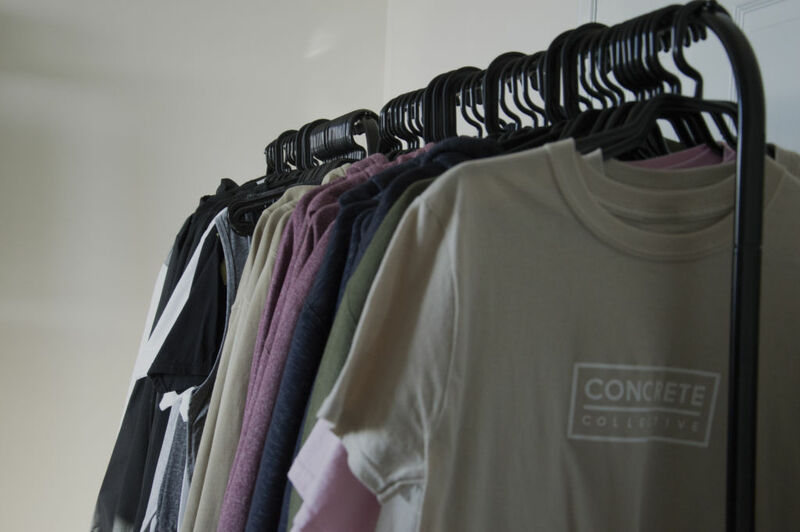 After months of hard work and preparation, the clothing brand Concrete Collective’s first collection was officially launched in late April of 2017. Between handling and packaging orders, responding to missed messages and following up with customers, the 24-year-old Nugent has been keeping busy with his new brand. After parting ways from his previous clothing company, Nugent hurried back to the drawing board. Thus, Concrete Collective was born. Nugent began studying business administration at Algonquin College but due to his entrepreneurial instincts, he soon transferred into the business management and entrepreneurship program. He felt as though he fit right in and graduated in 2014. Because of his experience, it felt natural for Nugent to begin his own company. Almost a year after the initial launch, he continues to look towards expanding. For now, he mainly works from the comfort of his own home. For now, to ensure there is profit, the collection is kept to a limited quantity. This way, inventory is sold before another collection is produced. Collections often include items such as varsity jackets, hoodies, T-shirts, long sleeves, baseball caps and snapbacks. The company also sets quarterly sales goals and promotions to help drive sales. Along with a few others, Nugent is able to keep his brand on its feet. Although it can be nice to be (almost) completely in control, as Concrete Collective continues to expand, Nugent will soon be looking for new people to contribute to the brand. He’s also exploring the possibility of hiring a summer intern. Nugent’s younger brother is one of the few who also works closely with the brand. Liam Nugent, 20, doesn’t necessarily have one specific position with the company but tries to help out where he can. However, he mostly acts as a sales representative. People often ask him for products and he spends a lot of time advertising and promoting the brand. He believes the company stands out for its desire to help build the community. Five per cent of sales go to non-profit organizations to aid in the reconstruction of Canadian communities. According to Nugent, sales have really picked up since the company’s first collection was released last year. 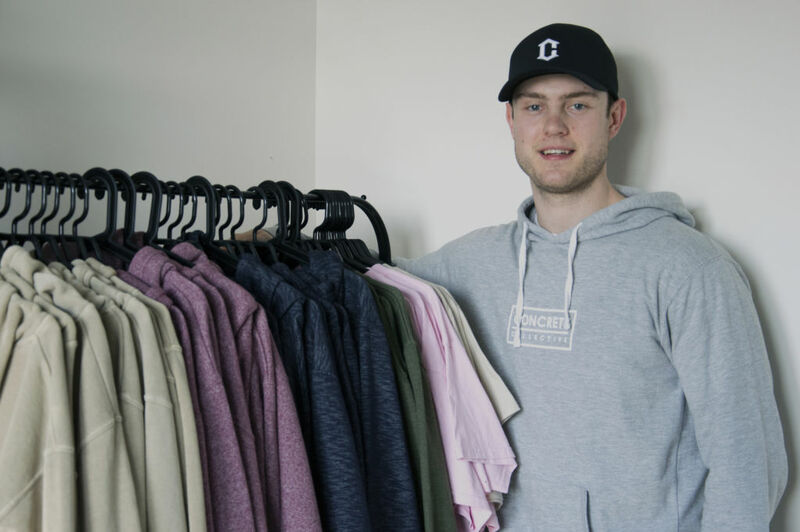 Concrete Collective began collaborating with the Ottawa Senators in November of last year, giving sales a good boost. The company even launched a collection that is sold exclusively at Sens stores in Ottawa. The collection features exclusive T-shirts, long-sleeved garments, fleece wear and baseball caps. The exclusive collection nearly sold out in the first week it hit the stores. Nugent says the company’s overall sales are still fluctuating, but for the most part, they continue to increase. Concrete Collective uses a simple but elegant design to capture the attention of all potential customers. With thousands of clothing companies worldwide, Concrete Collective competes with the top dogs with high-quality garments at fair prices. 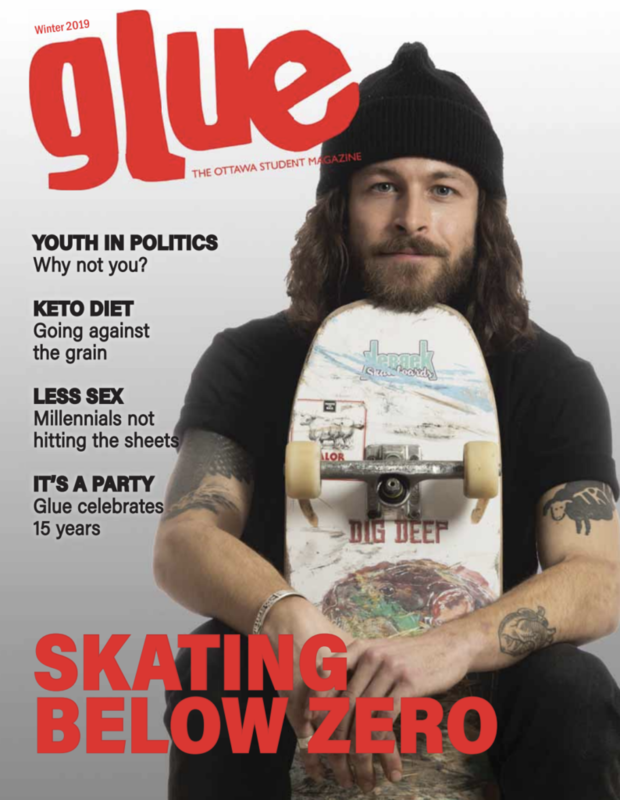 It can be difficult for a smaller brand to find its niche in such a big market but Concrete Collective is on the rise. As the entrepreneur steps back to take one last look at his display in his office before raising a camera to snap some photos, a proud grin appears on his face.